When you retune your guitar, it is important that you turn the tuning pegs in a direction that decrease the string tension and not the opposite. 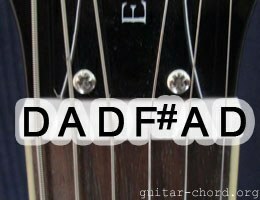 To get the open D tuning on your guitar you tune it like this: D A D F# A D.
D7: you can choose to also play on the 5th and the 6th string. You can also play with the 1st and 3rd strings open (000030). G7: an alternative is to include the 6th string and in that case mute the 5th. The corrcet name of the chord is in bothg cases G//D. A7: this is to be correct a A7no3, meaning that the third note (C#) is missing. These are some of the chords you could play in open position when using this particular tuning. You could in some cases skip the 6th string, for example, without playing on the six string the presented diagram with C/D would be C.
All you have to do is to lay your fingers over the four highest strings. You can also play on all six strings. As the pictures illustrate, the D chord can be played with all open strings. The shapes are movable, so if you move the fingers two steps up the fretboard from G major you will get an A major. This was an introduction about chords in Open D tuning, see also Open E tuning and Open G tuning.